Both seasoned guitar teachers and those starting out can leverage the online marketplace to build a career at a scale that's not possible offline. The world is your stage. There are billions (with a "B") of people, it’s diverse, and there are more music related money-making opportunities than just teaching (which I’ll get into more below). The web can also insulate you and your business from the ups and downs of your local economy. It’s not all roses, however. There are some technical hurdles to overcome, and getting people’s attention online is not the easiest thing to do. But the long-term benefits far outweigh the negatives. While we’re on the topic of what’s great, and what not so great about teaching guitar online, let’s go over a list of pros and cons. Then, if it’s still something you’d like to do, we’ll get into all the fun and fascinating details of how to start your online teaching career. The most obvious advantage is that you get to work from home. Not only is this cheaper than renting a studio (or any space to teach guitar for that matter), but how awesome is it to have that the freedom of working from wherever you want? Your audience is massive. Locally you may only have few hundred potential clients, but online there are millions. Once you have a system in place, marketing can be easier and less expensive than local advertising. Especially considering the number of people you can reach. Fewer daily expenses. If you were teaching at other people’s homes, just as an example, teaching online means you won’t be commuting as often, and therefore won't be paying for things such as fuel, parking, etc. Depending on where you live, making a full-time income from home might even allow you to eliminate a vehicle altogether (and save thousands of dollars per year). Students usually prefer to learn from home. If you were (or are currently) teaching at a school or an academy, giving lessons online directly to students means you won’t be sharing your revenue with anyone else. You can scale your online business by running webinars and teaching many students at once. In addition to teaching online, you can develop training videos and lessons that can be streamed online, or sold as complete course packages. By leveraging your social media accounts, websites such as Udemy, and your blog if you have one, course creation can become a major income stream for your business. It’s not one or the other (offline vs. online). You can do both. 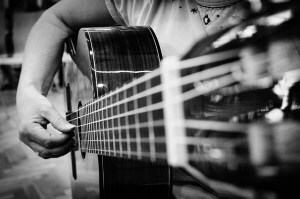 Teaching guitar online offers the unique ability to market music-related products and earn commissions that provide passive income. In fact, you may find in time that recommending products to students and others can turn out to be far more lucrative than teaching. I’ll explain more about this further in the article. Teaching online is the future. Acquiring the technical, and marketing skills to do it successfully now, will prove extremely valuable for you moving forward. Teaching guitar online requires some technical knowledge and equipment. Depending on your business model, you may have to learn about online payment systems, and how to set them up. It’s true that the number of potential students is almost unimaginable, but you are also faced with a lot of competition. So, while building your following can be easier over time, and eventually turn into a constant flood of students, it can take longer to get the ball rolling and require some clever marketing strategies. There are certainly advantages to working with a student one-on-one. It’s easier to demonstrate finger placement for example. Most of these challenges can be solved, but having that video barrier means you may have to be more patient and creative. With a global client base, the time change can make scheduling difficult. Technology has come so far that chances are, you already have the necessary equipment. Of course, you will need a computer, and an internet connection. You can use the built-in camera on your computer screen (if it has one). Most computers today do. You can use your cell phone camera. If your phone is relatively new (in the last few years), the camera quality will be sufficient. Something you may want to consider is a dual camera set-up. Use your computer or laptop camera for your students to see you, and have your phone camera focused on your fretting hand. You can pick up an inexpensive cel​​​​​l phone tripod. 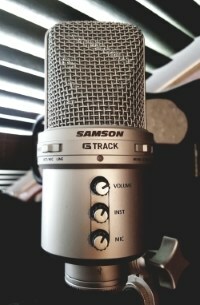 Your computer microphone is sufficient when starting out, but eventually, you may choose to invest in a professional one. There are several options here. Google+ Hangouts is probably your best choice because of its simplicity and number of features. Also, it’s free. All you (and your students) need is a Google Account which you can get here. Skype is another feature-rich and free option. If you plan to do webinars and charge people to attend, you can use a software such as GoToWebinar, Adobe Connect or Cisco WebEx. If you are an Apple user, I would not recommend Facetime. While it’s easy to use and works well, it’s only good if your students have an Apple computer or tablet as well. One more thing to consider is to have accounts and to be ready to use both Google+ Hangouts and Skype. That way, if one is having connection issues, you can quickly move your lesson to the other. To make this more efficient, create simple tutorials to help assist your students in setting up and using both. Yes, you will need to get paid. Paypal is probably the most well known and trusted method to transfer money. Of course, you could set up email bank transfers through your personal account, but students may be hesitant to email money. Paypal gives them (and you) confidence and protection. It’s also free to sign-up. You will be running your own business online. In addition to applying for your personal tax number/business ID, you may want to invest in some basic bookkeeping software such as FreshBooks. To be honest, you can probably get by with simple handwritten notes and an app such as CamScanner. CamScanner turns your phone camera into an excellent scanner, which will give you digital copies of all your notes and lessons so you can email them, post them online, etc. If you have a tablet such as the Surface Pro, it comes with a pen that allows you to write and draw accurately on the screen. Your next option could be a music notation software such as Sibelius which allows you to compose, edit, play and share your music. You can also export and print it. Now that you’re all set-up, you need students. The best place to start is with the resources you currently have. You've probably already thought of some promotional strategies, but one example is using a referral program. If you are teaching now and have students, you may consider offering free lessons in exchange for them recommending you on their social networks. For every new online student they bring in, you can provide another free lesson for example. You can make that same offer to each new student and have an ongoing referral program. How you structure it is entirely up to you, but don’t underestimate the power of word-of-mouth recommendation. Set-up a Facebook group and encourage your students to participate, and get to know one another. 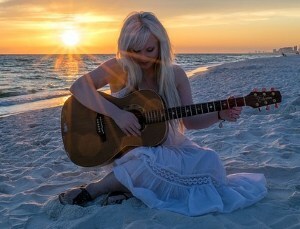 You can post music and guitar related content that brings others to the group as well. By using inexpensive Ads (on Facebook and/or YouTube) and offering free beginner lessons, you can gain an audience and invite them to become full-time students. Also, when people sign up for free lessons, they will go onto your email list. This way you can keep in touch with them even if they don’t accept your offer initially. Do not send them spam. Only provide valuable content and resources, and you may build a relationships over time. Then, periodically you can mention offers, or deals you're putting on. If you were to do these online beginner classes once or twice a week for 20 - 25 people at a time, you would eventually capture quite a few students, and build an email list that will become the foundation of your future marketing efforts. While doing this, you can start building social followings on other platforms such as Instagram, Twitter, and Snapchat. As those groups grow, you can invite them to join your Facebook group. Being able to leverage social platforms to expand your business is great, but you don’t want to depend on them as a long-term business plan. Many people have watched their businesses crumble over night because Facebook, or YouTube changed algorithms and re-prioritized the content they were putting in readers news-feeds. So, your ultimate goal should always be to build your personal brand on your own platform. A website. ​You will spend a significant amount of time creating content such as lessons, articles and videos. Don't do it to make someone else's platform grow. Do it for your own website, and leverage those other platforms for your benefit. As your site grows, you can add search engine optimized (SEO) content, so people will find you when they are looking for something specific online. You can also package and sell your own guitar courses, and recommend music related products and earn commissions. If you’re not familiar with online marketing, specifically affiliate marketing, you may be surprised to know that earning commissions from recommending products is the primary method people are using to make money online. An article catches your eye, and you click on it. Somewhere, in that article will be a link to purchase the guitar. That link is called an affiliate link, which takes you to a website such as Amazon or the Guitar Center. If you buy the guitar, Amazon (or the Guitar Center) will pay a small commission to the website that sent you there (at no additional cost to you). So, if you have a personal blog as your home base online, not only can you use it to market your online guitar lessons and courses; you can also earn commissions simply by reviewing and recommending guitars (and related products). It’s not an overnight plan, but this path could eventually free you from your day job so you can build a business around something you love to do. The great thing about this strategy is that it’s entirely possible that your product revenue eventually exceeds your guitar lesson revenue. This allows you to become significantly more competitive as a guitar teacher because while other instructors are dependent on their teaching rates, you are not. To learn more about affiliate marketing a great place to start is on this page, which has a list of my top recommended training programs. A few offer free versions of their programs. This, in addition to your social marketing efforts, will provide your business with a solid foundation going forward. Of course, no article about online guitar lessons would be complete without mentioning YouTube. The challenge with YouTube is that you can't set-up a payment system. But you can earn money through Ad revenue and it’s a great place to market yourself. If you decide to start teaching online, setting up a YouTube channel and offering some free basic lessons should be part of your strategy. The key here is to use FREE YouTube traffic and send potential students to your website. In fact, the best marketing strategy is to use all sources available to you whether it’s YouTube, Facebook, Google Search or any other platform and send that traffic to your personal website. Then, with your site set-up properly, it does all of the marketing and sales for you. This strategy can help you create a true residual income. As I mentioned earlier, a very effective way to market yourself is through email. When people visit your website, offer them something free. This is called a lead magnet, and probably the most used marketing strategy online. In exchange for the free product, which could be a free guitar lesson, or even a monthly newsletter, you will require an email address so you can send them the details. Once you have their email, they will go on your subscribers list. Again (and this is EXTREMELY IMPORTANT), do not spam them. I’m not sure spam has ever worked, but it certainly doesn’t work today. Don’t ever sell their email either. They are trusting you, and your biggest asset online is trust. Plus, it's the right thing to do. The purpose of having an email list is to build a relationship with your subscribers. People who visit your site may not be ready for guitar lessons today, but six months from now, they might be. If you’ve built a relationship with them by providing REAL value, there’s a good chance they will turn to you. I can’t imagine a better life than doing something you love, getting paid, and doing it from home or wherever in the world you want (as long as you have an internet connection). And, now is the right time. The price of technology has never been lower or more accessible, and we’re at a crucial moment in history as far as teaching online goes. If you don’t follow new technology, you may not be aware of the tidal wave that’s on it's way. Virtual reality, and more importantly, augmented reality, will impact the way we live as much as the internet itself has. While that’s a topic for a different article, the applications for these technologies in teaching are tremendous. For example, a traditional school campus can cost hundreds of millions of dollars to build and maintain. They require a large staff, constant upkeep, infrastructures such as roads, parking, public transit as well as water and electricity. In the next 5 – 10 years, some predict we will see virtual schools, in virtual environments that provide all the opportunities to interact, socialize and learn that a traditional school does. But, there will be no substantial costs to maintain them, and students and teachers from all over the world will be able to work and learn together in much the same way as they do now. In fact, students and teachers will no longer be confined to a campus, but will be able to travel to any virtual environment imaginable. Imagine spending a day on Mars with your classmates. Augmented reality such as Microsoft’s HoloLens, will make teaching guitar online (or any musical instrument) seem as though you and your students are sitting in the same room. If giving guitar lessons is your future, there’s never been a better time to get online and start building your own community. Please leave a comment below; I’d love to hear your thoughts. Are you a guitar teacher looking to take your business online, or just starting out with plans to replace your day job? Thank you so much for this article. It really help a lot. I’m now more inspire to teach guitar online and eventually earn money. I always wanted to do this but things doesn’t go smoothly but with your article, it gives me the momentum to continue on my passion.